NASA has invited you—a Very Important Person—to see the launch of the new Space Technology 7 (ST7) spacecraft. You plan to drive to the launch site in your snazzy new car with its built-in "Vector-Nav" system. You don't need a map. A map wouldn't do you any good anyway, because no one will tell you where the launch site is! Thank goodness the car's computer can receive signals from NASA about the route to take. But the computer can handle only one piece of the route at a time. 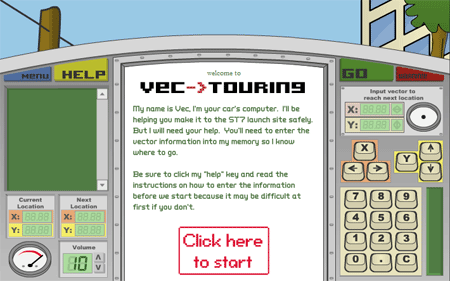 Click here to play Vec—>Touring. NASA is looking for Earth-like planets outside our solar system. One way to do this is to fly three or more spacecraft at great distances apart in space, but have them be absolutely locked together in their positions as if they were welded onto a rigid frame. Working together, the spacecraft would be like a huge telescope, making it much easier to spot Earth-sized planets around other stars. Such a formation-flying telescope would also study black holes, supernovas, and other violent events in the Universe. How can three spacecraft stay exactly in the same exact pattern? Vectors! However, in our game, we only have to worry about the X and Y directions. In space, we have to add another direction, Z. That makes it a lot harder! Here is how to fly in perfect formation! Space Technology 7 will test an advanced technology that will allow NASA to fly several spacecraft in a very precise formation. 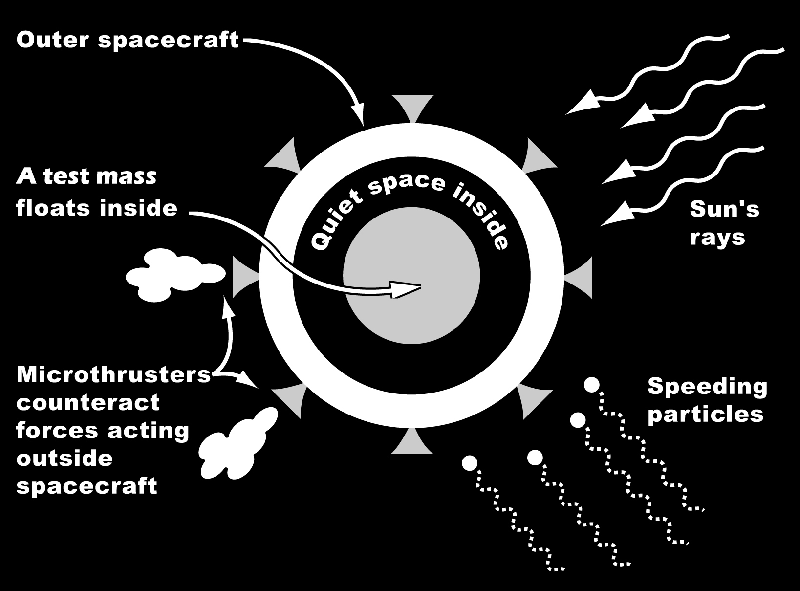 Even in space, small forces can push spacecraft around and disturb their tight formation. 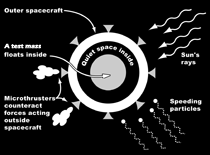 ST7 detects these tiny movements of the spacecraft "off course." It figures out how to correct for these tiny errors and fires tiny thrusters in the opposite direction. What's all this got to do with the vector game? ST7 must calculate the vector (in this case, a force, with amount and direction) required to make the correction. Then it will calculate which of several thrusters to fire together that will combine to produce the desired result.